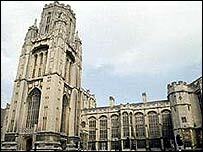 The University of Bristol is set for a new Chancellor - a position once held by Sir Winston Churchill. The Right Honourable Lady Justice Hale, DBE, appeal court judge and legal scholar, has been nominated to succeed Sir Jeremy Morse. Sir Jeremy, a former Lloyds Bank Chairman, has been Chancellor since 1989. Vice chancellor, Professor Eric Thomas, said: "I have no doubt that Dame Brenda Hale is up to the task. "She has the wisdom and intellect, the experience and the personal qualities that the role demands." Previous Chancellors include Sir Winston Churchill and Nobel Prize winner Dorothy Hodgkin. Dame Brenda studied Law at Cambridge and received her year's only starred First. In 1966 she became an academic at the University of Manchester, eventually specialising in social welfare and family law. She was appointed a Queen's Counsel in 1989. The Chancellor is the University's main figurehead, confers degrees at graduation ceremonies, and supports fundraising efforts.